The efflux of CO2 from the soil surface can vary markedly in magnitude both in time and space and its correct determination is crucial in many ecological studies. In this paper, we report results of field measurements, using an open-top dynamic chamber, of soil CO2 efflux in a mature Florida slash pine (Pinus elliottii Engelm. var.elliottii) plantation. The daily average efflux was 0.217 mg CO2 m-2s-1 in the autumn and 0.087 mg CO2 m-2s-1 in the winter. Soil temperature, which accounts for most of the temporal variability in CO2 efflux, is by far the most influential factor controlling soil respiration rate and its temporal variation. The CO2 efflux in the slash pine plantation is highly spatially variable and effluxes from the soil under palmetto is significantly higher than that from the open floor. The CO2 efflux generally increases with increase in soil fine root biomass, litter and humus amount on the forest floor but is inversely related to the amount of organic matter in the mineral soil. The spatial variation in CO2 efflux can be well characterised by a simple multiple regression model incorporating live and dead biomass and soil total porosity as predictor variables. Understorey plants, mostly Serenoa repens, are an important component of the C cycle and the major contributor to the spatial heterogeneity of soil CO2 efflux. 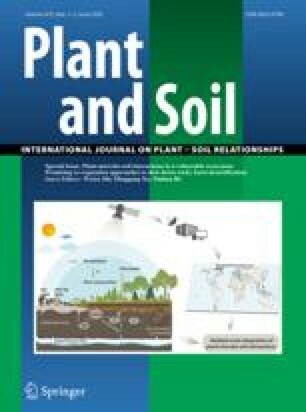 The influence of understorey plants on soil respiration is probably via two approaches: increasing litterfall and root metabolism, both consequently stimulating microbial activity in the mineral soil.